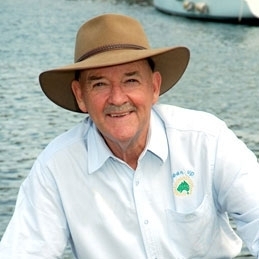 As an avid sailor, Ian Kiernan AO sailed solo around the world in 1987 and was shocked and disgusted by the pollution and rubbish that he continually encountered throughout the world’s oceans. Upon returning to Sydney he organised a community event – Clean Up Sydney Harbour. The public response was so enormous that it grew into the Clean Up Australia campaign, and in 1993 a similar Clean Up the World operation which attracted participation from 30 million volunteers in 80 countries. He received the Order of Australia Medal (OAM) in 1994 and the UNEP SASAKAWA Environment Prize in 1998. He received the World Citizenship Award from the World Association of Girl Guides and Girl Scouts in 1999. Since then Clean Up Australia has evolved into an organisation that works with the community, government and business to provide practical solutions to help us all live more sustainably every day of the year. Like many Australians, I’ve spent my life around water and I can’t imagine it any other way. When I sailed solo around the world 26 years ago, the sad state of our oceans inspired me to want to leave something better for our kids. That’s why I started Clean Up Australia. It’s also why I was very pleased to see new Marine Parks being created out in Commonwealth waters. Our oceans aren’t as healthy as they used to be, and no one can say that fishing’s as good as when we were nippers. You know I’ve heard some people claim that recreational fishers are going to be locked out of a third of Australia’s waters by these new Marine Parks. I reckon that’s garbage, and I wanted to explain why. So I’m helping to get the word out, asking Australians to check out the situation for themselves. When you have a look at the maps and see that recreational fishing is unaffected in 96% of waters in the first 100 kilometres offshore, I reckon you’ll agree that these new Marine Parks are pretty reasonable. By setting aside some areas now, we’ll be safeguarding a lot for the future. This’ll help make sure that the good times that you and I have had are going to be there for the kids. And I reckon that’s a pretty good thing. Don’t you?